Do you ever see an image online or in a magazine that stays with you because you love it so much? That’s what happened the first time I saw vintage fabric draped on a vintage ladder and used for decor. I was smitten. Vintage ladder decor is popping up more and more all over blogs and Pinterest. I even have a Pinterest board dedicated to just that! Randomly over the past few years I have shopped for a vintage ladder. I have never seen one at my antique mall that I could afford. I don’t really go to garage sales (I know…for shame) so that wasn’t an option either. I would occasionally see one on eBay but the shipping was always ridiculous. I would then talk myself out of the whole idea with lots of excuses. Where would I put it? I sew with my vintage fabric so would I even have anything to put on the thing? Finally a few weeks ago I was looking for vintage fabric (shocker) on eBay and found a seller who specializes in vintage ladders (among thousands of other things.) The ladders were priced affordably (in my opinion after searching for a long time) and the shipping was reasonable. The seller even lets you request a specific height. I originally decided to go with a shorter ladder to save money on both the ladder and shipping. After thinking about it though I changed my mind and got what I wanted in the first place. Should I have stalked garage sales to find a ladder for $10? Do I wish my parents had one of these in their garage that I could have for free? Of course…but those things didn’t happen. I have been thinking about this for at least 2 years. I know this ladder will never be a treasured family heirloom. My family thinks I’m a little crazy anyway what with this and my gigantic dough bowl leaning on walls in my living room. However, I adore it. It makes me smile when I walk in the room. It sits behind my chair and I can smell the fresh-from-the-dryer scent from the grain sacks. If I need a grain sack for an Etsy shop order I can pluck it from the ladder and throw up something else. The sky is the limit. So…there you have it. Have you ever thought about (ok…obsessed about) something and then finally followed through? If yes, I hope it made you blissfully happy. After all, you deserve it. I love your ladder Ann! And yes I obsess about everything… That’s how I got a new dining room table and I’m planning on obsessing about a couch next lol. Love the ladder, Ann..but I especially love all the fabulous frenchy linens! I love ladders!! We are living in Germany for a few years, so I find tons of cool decor stuff at flea markets. Four ladders so far! It looks gorgeous Ann, worth every penny. It looks just perfect, Ann. And, of course we don’t think you are crazy. I have many times looked for an item for years, and then boom there it is. When that happens, I scoop it up crazy fast. I love all your grain sacks. I fell in love with them about 10 years ago in France when I saw a chair seat upholstered with one. It was in a window of a store that was closed. I came home and searched everywhere for fabric like that and finally discovered where it came from. I’ve bought severalbags and sized them down to slip over my dining room chairs (like a pillow case) The chair seats are a natural linen. Like you, they make me happy whenever I look at them. I still have leftover fabric to make some other items – maybe pillows or a patchwork tote (another item I saw in France). Looks great with your collection of fabric…I have a ladder in my master bathroom that I love. Enjoy!! I love it! And I’m so glad you got the size you wanted. 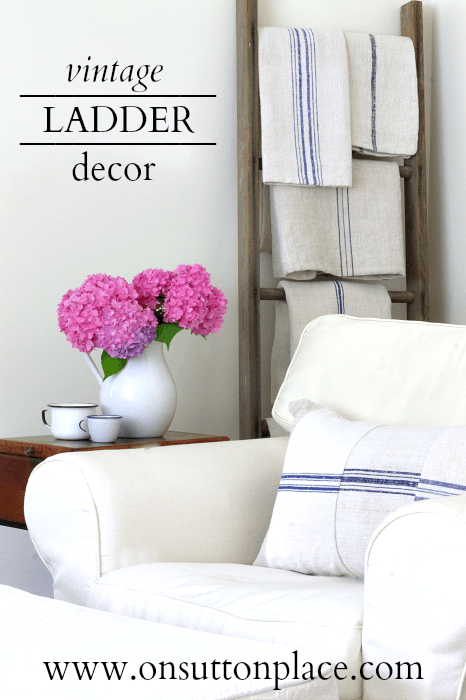 Your beautiful linens on the ladder makes it looks so french inspired and very very pretty! LOVE everything you do Ann! I love vintage ladders as well. I love how yours looks with that beautiful fabric. I found mine at a barn thrifty/antique type place that I enjoy going to, but I had been looking for a while. Ann, I’m so glad you found what you had been dreaming of having. I absolutely love it with your grain sack linens displayed on it! I’m looking around to see where I could put one of those, but I don’t seem to have one square inch available! Your hydrangeas are so beautiful-I remember when you were lamenting that they weren’t blooming! Love your new “old” ladder! Your fabric looks great on it. If you’re like me, you’ll always have extra fabric to hang on it. Something that makes you smile every time you see it is a treasure! Glad you finally got exactly what you wanted! I love the way it looks! Ann say what Loreal says….”I’m worth it!” and because if it makes you smile it is priceless! 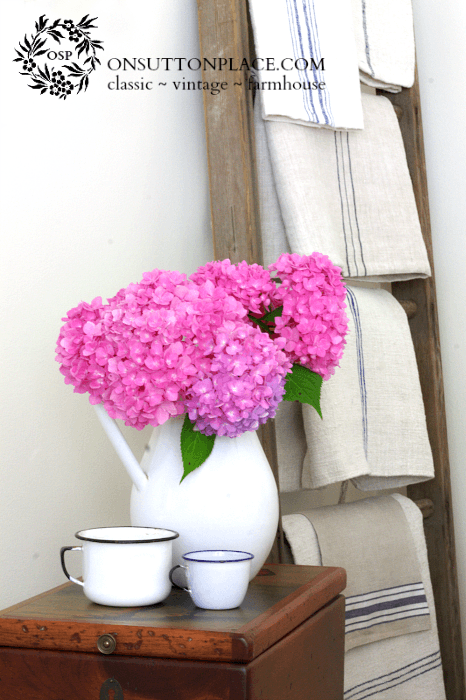 Such a wonderful way to display your gorgeous linens…So glad you found one!!! Omgosh Ann, I ♥♥♥ it and it is perfect to hold your vintage fabrics, and what a beautiful display it makes. I have admired the use of ladders as towel racks for years. I think it is beyond perfect for your home especially with the giant dough bowl. Big is better less is more!!! i love it Ann. It looks great with your linens. I like the look of vintage ladders, too, but don’t know where to use one in my house. I saw some nice orchard ladders at the Country Living Fair last year and very reasonable prices. It looks wonderful leaning against the wall with your fabric! I have also seen these in bathrooms with towels draped over the rungs. You hit the nail on the head with “It makes me smile when….” Life needs more smiles. Your blog gives me many of mine and your inspirational ideas that work in my home make me happy. As always ~ thank you. looks beautiful Ann, one of the best I’ve seen! I have one, it’s been outside for ages. Recently my daughter wanted it after seeing it used for towels in a bathroom on pinterest of course. Mine had been used for clematis. I would put it inside but my little 2 year old grand-daughter who is here a lot would just want to try to climb it endlessly. So I will wait…and my daughter will have to get her own! 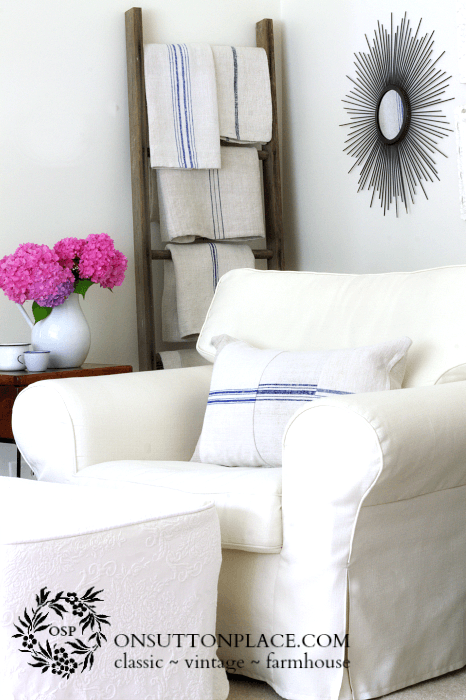 The ladder with the grain sack fabric draped on it is a really nice addition behind your chair. I know it must put a smile on your face. 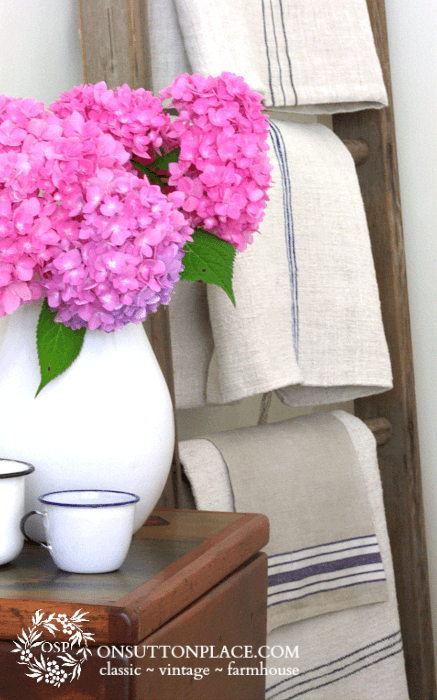 But the hydrangeas – oh my! They are stunning! Love the color! The ladder looks great with your club chair, and adds a lot of interest to the corner of your room.. LOVE the grain sacks. I love it too, there’s something about a ladder with cloths draped in them and yours found the perfect place. We’re thinking of redoing our master bathroom, so I already have one planned for our towels…so exciting! Life is short, I think it’s important to surround ourselves with things we love. So pretty, Ann! I am jealous of your white slips too, mine aren’t looking as fresh with my guys and the dog lol. I had two step ladders, one turquoise and one wood, and sold them both because what I am really searching for is an old apple ladder or a simple rustic one just like yours. Love it Ann! I too had been wanting one for awhile now and last fall just broke down and purchased one from a vendor. Enjoy your new ladder! Thanks so much for your information Ann, I didn’t know they sold them on Ebay. Love yours with all of the gorgeous grainsacks on it! LOVE the ladder with your grainsacks!!! No matter what the family says, it looks beautiful with your decor! It’s so beautifully styled. Hmm… do I need one now too ;) JK! It’s perfect in your home. Definitely you. Isn’t it wonderful to get something you’ve been dreaming of? Now, you can daydream of something new! Love it. I missed out on a great one about 6 months ago, a antique shop was closing their business and everything was half price. And guess what a person bought it 5 minutes before I arrived. Have a great day! Like the linens that you have displayed on it too!